I’m a bit of a vitamin queen anyway, I take my vitamins daily and I swear by Berocca. Whenever I forget to take them I get ill – a couple of weeks ago was a prime example, I’d been caught by the dreaded lurgy, okay just a cold but god was it annoying, coughing your way through meetings just isn’t fun! So this vitamin boost came at the perfect time. I’d tried everything to get rid of it – ginger, garlic, inhaling vast amounts of oranges and kiwis!! So the only answer really was a Drip and Chill – but what the hell is a Drip and Chill? It’s basically one of the fastest ways to get vitamins into your system, they concept was pioneered by EF MEDISPA, and uses a drip which is inserted into your arm to take the vitamins from the bag straight into your blood system. 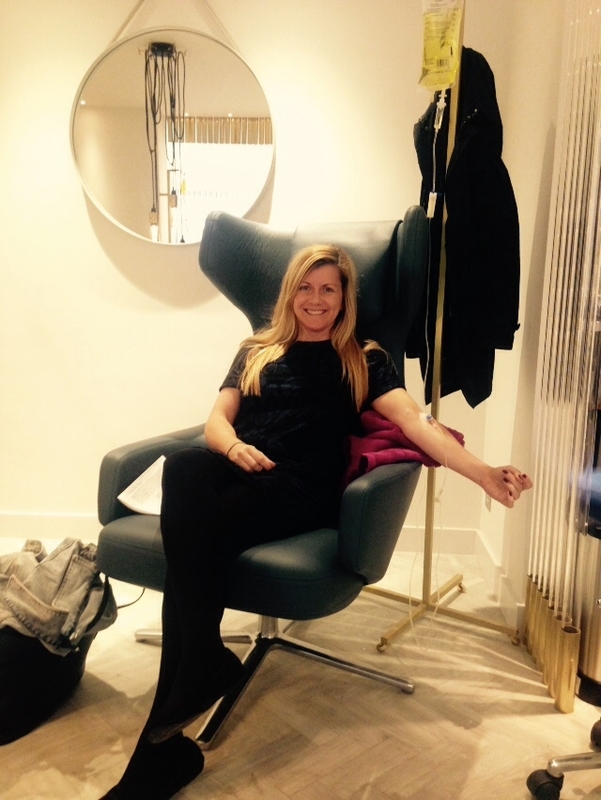 And it’s pretty bespoke too, after I filled in a detailed questionnaire they packed my vitamin drip with unique vitamins which worked for me – including Vitamin B12, Calcium and Vitamin C. My drip was called the Diet and Detox and helped you to get rid of anything nasty lurking in your body – but would it get rid of my cold? On the day I turned up and was greeted by the lovely staff who explained how it would work and attached the drip to my arm. From start to finish it only took around 45 minutes and I was left to read magazines and relax while the vitamins went into my body. It did feel slightly odd, it’s not every day you get vitamins pumped into your body, but its better and probably easier than eating a whole fruit bowl. Which I really don’t recommend you do! The next day I still felt a little ill, my annoying cough was still there, but I also felt more alert and human than I had over the last few days. By the afternoon I found that I had more energy and by the weekend, after a boxing class, I actually felt energised and not knackered. By Sunday, and even with a hangover, I felt better than I probably should have, which led to a way more productive day than if I’d had a hangover without a vitamin drip! Shame the drip isn’t a weekly occurrence…..now where did I put that berroca?!? Fancy a Vitamin boost? Go to EF MEDISPA for more info and prices.